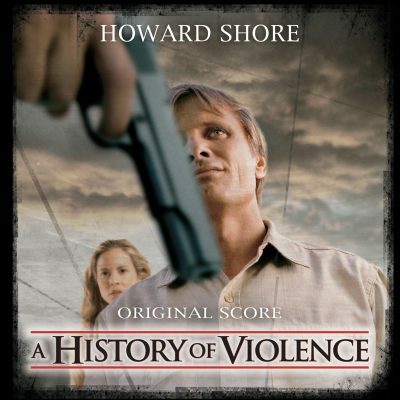 A History of Violence is the modern-day tale of Tom Stall (Viggo Mortensen) who gets dragged into a spiral of mobsters and violence after he confronts two thugs in his diner. Crime lord Carl Fogarty (a menacing Ed Harris) then enters the scene, claiming that Stall used to work for him, and the movie follows Stall as he confronts his past and the impact it’s having on his family and local community. Recorded at Air Lyndhurst, as opposed to his regular Watford Colosseum, Shore has fashioned an ominous score that is essentially structured around two or three themes, and primarily around the character of Tom. First revealed in track two, Tom’s theme is immediately recognisable as a cousin of Shore’s Fellowship theme, though its roots are more Americana than Middle Earth. In many ways we have been spoilt by the 12 hours of music that Shore composed for The Lord Of The Rings trilogy. The sheer amount of work that went into such a massive exercise inevitably led to close scrutiny and unravelling of themes. Even those of us who were familiar with Shore’s pre-Rings work discovered a new familiarity with the Shore sound, and it’s an immediately recognisable timbre that colours his work. Primarily played on the French horn, Tom’s theme is echoed on members of the woodwind family, prior to its subsequent re-appearance across the remainder of the score. Opening cue ‘Motel’ is a very low-key affair – sustained layered strings with only hints of dark woodwinds; Shore is setting the scene for what follows. The already-mentioned ‘Tom’ lifts the mood, as does the gorgeous ‘Cheerleader’, a soft flute-dominant love theme for the married couple that encompasses the depth of their relationship before the bad things start happening. In the following track, ‘Diner’, the movie’s catalyst erupts as Tom confronts the villains in the diner and we realise that nothing can be the same again. Gone is the soft woodwind, replaced by brass clusters and heavy percussion. ‘Hero’ offers a fanfare of Tom’s theme again as he is commended for his actions, but it’s the calm before the storm, with ‘Run’ being a tense exciting action-packed cue as Tom runs back home to… no, I won’t spoil what happens next. ‘Violence’ is the meeting point of all the material that has preceded it, with Tom’s theme, the ‘Cheerleader’ love theme and dissonant elements from ‘Diner’ clashing and fighting for dominance. Shore himself notes that “we explored the idea of the film as a classic Western where the visceral battle between good and evil is examined.” Inevitably, the darker threads triumph at this stage and the innocuously sounding ‘Porch’ offers another heavy dose of dark sustained strings. ‘Alone’ is a contemplative time-out for Tom as he reflects on the preceding events and plans what happens next. As expected, Tom’s theme breaks through the darkness, but it’s a variation on the softer version we saw at the beginning, reflecting that Tom (and his accompanying musical motif) cannot be as innocent as it was before. This bastardised version is tougher and will be present through the rest of the disc. ‘The Staircase’ shows that even the sweet Cheerleader love theme is not safe from dark intrusions, internalising Edie’s emotions as she masks the reality of her situation. ‘The Road’ and ‘Nice Gate’ take the violence to its bitter conclusion before the respite found in ‘The Return’. ‘Ending’ pulls the musical threads together again, allowing the softer aspects of the now-darker Tom’s theme and Cheerleader theme to re-establish themselves before the movie ends. An accomplished score from Shore that dips its toes into his previous superior thriller scores Copland, The Silence Of The Lambs and Panic Room, though with an even greater emphasis on the human elements. Probably the most accessible Cronenberg score to date and certainly a welcome addition to the Shore canon as we eagerly wait for King Kong. Published September 2005 in Music from the Movies.